We have been privileged to welcome two new members to the team at Simon Thomas Pirie Ltd over the last year. 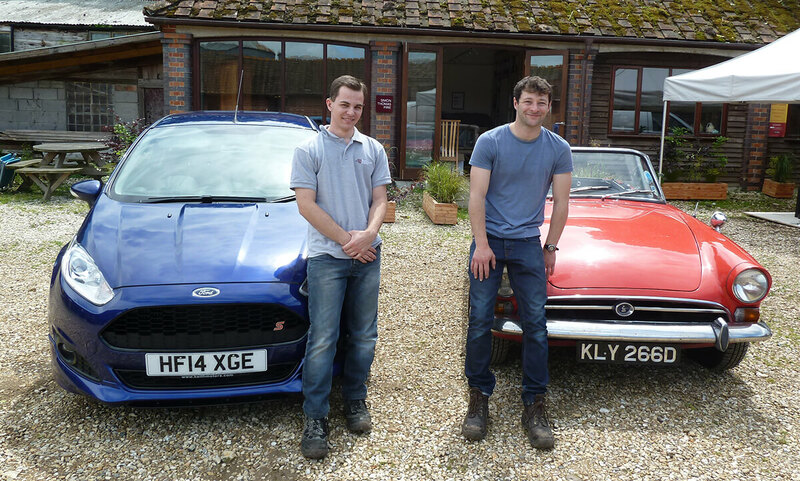 Tom Cornick (left) and Mike Clifton-Dey are both keen on their cars but just as they have chosen very different sets of wheels for their daily commute, they have taken different routes to get here. Tom came to us for a short period of work experience while studying for an A level in Design. 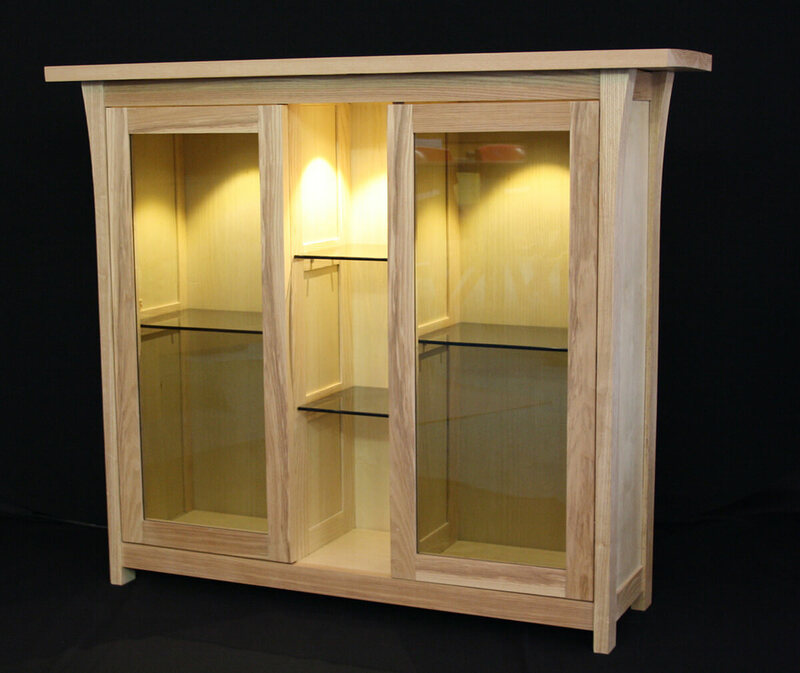 He and Simon hit it off immediately and once Tom returned to school, he stayed in touch regularly to pick Simon’s brains for advice on the completion of his final project; not surprisingly a cabinet. Simon was impressed with Tom’s dedication, tenacity and not insubstantial talent and suggested that he might consider an apprenticeship here at Simon Thomas Pirie Ltd. 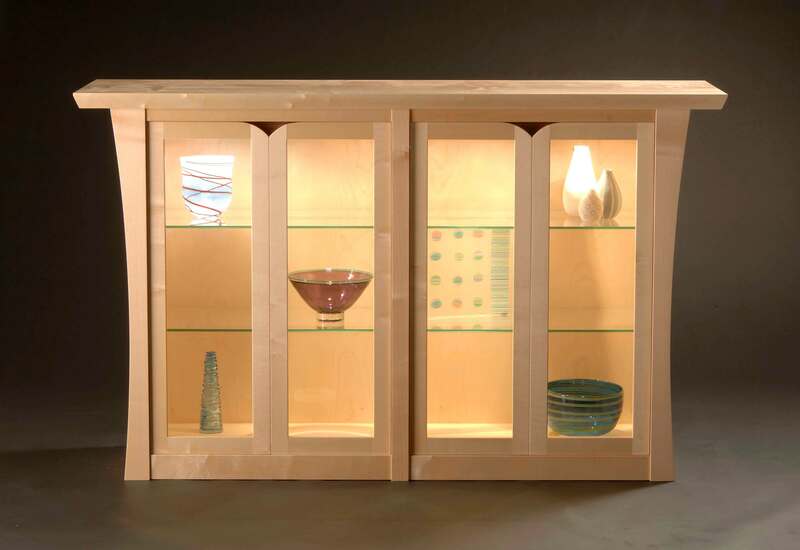 The cabinet Tom designed and made for his A Level (left) next to the piece that inspired it designed by Simon. For Tom, meeting Simon and seeing the workshop opened his eyes to the possibility of following in his both his grandfathers’ footsteps; one having been a joiner and the other a carpenter. The opportunity to complete an apprenticeship working with our talented team of designers and makers felt like a natural progression and he embraced it enthusiastically. Tom and workshop manager, John, worked together with training provider, DIDAC to formulate an apprenticeship plan and consequently Tom has been working with us since September. His DIDAC tutor comes into the workshop for a day every 2 to 4 weeks to work on specific making skills and the supporting written assessments and it has been a joy to watch Tom applying the skills he has learnt to the tasks he is set in our now bustling workshop. ‘New’ Mike (so called because of Mike Smith, our longest serving employee and senior maker) has been known to us for some time as the son of our upholsterer Robin Clifton-Dey. Mike has already completed an apprenticeship but in a very different environment as an engineer for Rolls-Royce Aeronautical. He has also completed a furniture-making course at the Lyme Regis Boat Building Academy (right) and was looking for an opportunity to further his knowledge and improve his skills. He joined us in March as our order book became frantic following the development of our outdoor garden furniture range in collaboration with Sitting Spiritually. 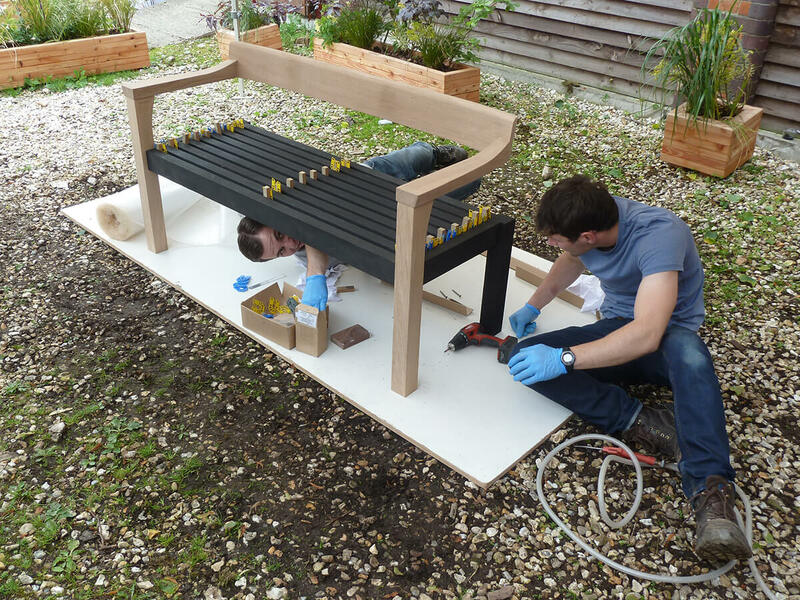 His engineering and upholstery background has already been put to good use what with processes such as steam-bending components for Floating Benches and covering acoustic panels for TV walls becoming an increasing part of what we do. We look forward to ‘New’ Mike sticking around long enough to become a misnomer! It gives us great pleasure to find young, enthusiastic makers who really understand what we are trying to achieve and when we do we believe it is our duty to foster and encourage them to make the very best of their individual skills and diverse characteristics. As many teachers and trainers will testify, the best learning is achieved when a problem is solved collaboratively. This has proved to be true for our new recruits who work exceptionally well together when interpreting drawings and approaching challenging tasks, supporting each other to reach a sensible solution: all under the watchful eye of John and ‘Old’ Mike, of course!